ElGeeBee, Marian and I departed the Charleston area at 5 AM on Friday in the hopes to be able to do some fishing that afternoon. We were making pretty good time till we got to the Virginia State Line at the Welcome Center. We stopped to shoot a short clip of the three of us at the Virginia State Line Sign yelling “BOONDOGGLE”. Then a young woman with vehicle problems asked if we had jumper cables. So ElGeeBee to the rescue; unfortunately we could not jump start her truck so we left the Welcome Center while she attempted to locate professional assistance. We arrived in Virginia Beach about 1 PM. So we decided to visit Ocean East 2 (OE2) to get a local fishing report for the area. We bought some 3/8 & ½ oz Jig Heads and some 4” Gulp Grubs. We were unable to check-in yet so we visited the beach at 1st Landing State Park. About three we managed to get into our cabins, unload the vehicles, and headed to Broad Bay in the hopes to connect with some Boondogglers. Getting at Broad Bay we did not run into any Boondogglers but launched from the sandy beach and paddled to the right in the search of fish. When we got past the boat ramp we noticed an area that had flags and markers. We were not too sure what this area was so we stayed away. I started casting along the shore line but I was not getting any hits. So I decided to fish the parameter of this area loaded with flags and buoys. After a few cast I managed to hook into a small Redfish. By then the sun was starting to set so we decided to start paddling back to our launch site and head back to 1st Landing State Park in search of our fellow Yak Anglers. While heading back Marian managed to hook into her first Redfish. She was super excited. Of course I had to help her remove the hook and explain the proper method of releasing the fish. So far ElGeeBee is zero on fish for the Boondoggle. Arriving back to the state park we stopped by YakSushi & Adam’s cabin. There we ran into the Loziers, Sam, Garth, and several other anglers that escape my mind. We visited for a while then decided it was time to get something for dinner. While at OE2 they recommended eating at Croakers Neighborhood Grill; so we decided that would be the place. The gentleman from OE2 was right. The food as super and so was the service. I had the Broiled Croakers Platter (Shrimp, Fish, Clams, Scallops, Crab Cake) with Sweet Potato Fries. I also had a nice cup of their Hatteras Style Clam Chowder. Returning back to the cabins I proceeded to prepare for tomorrow mornings launch at Lynnhaven Bay in the hopes of catching something big. Marian decided that she would sleep in and wait for her sister and brother-in-law (Alice and David) from Baltimore to arrive. Marian, Alice, & Dave would join us at Lynnhaven for a day of fishing & Kayaking. ElGeeBee & I arrived at the launch before the sunrise. We were greeted by the Lozier Family when we got out of the truck. We unloaded the yaks, set-up the fishing machines, carry them to the small sandy beach for the launch at first light. As other anglers arrived we assisted to helping in moving the yaks to the launch site, discussed possible fishing areas new to us, looked at the various configurations yaks, and of course signing up for the mini-rod event. When Treehugger arrived it was time for the group photo. We all launched into the small creek and “The Clone” attempted to fly this aerial camera taking photos or a small movie clip of the launch. A couple of times I thought the thing were going to crash. I have not yet seen the clip but I’m sure it is great. While paddling out I got the opportunity to visit with local expert Speckle Trout Joe. Joe was very helpful in providing guidance on the local area. The fishing was slow for everyone. Eventually I got my first Red on the Mini-Rod. My mini-rod is decided for ice fishing for Walleyes & Northern Pike so the fight was not too difficult for the set-up. 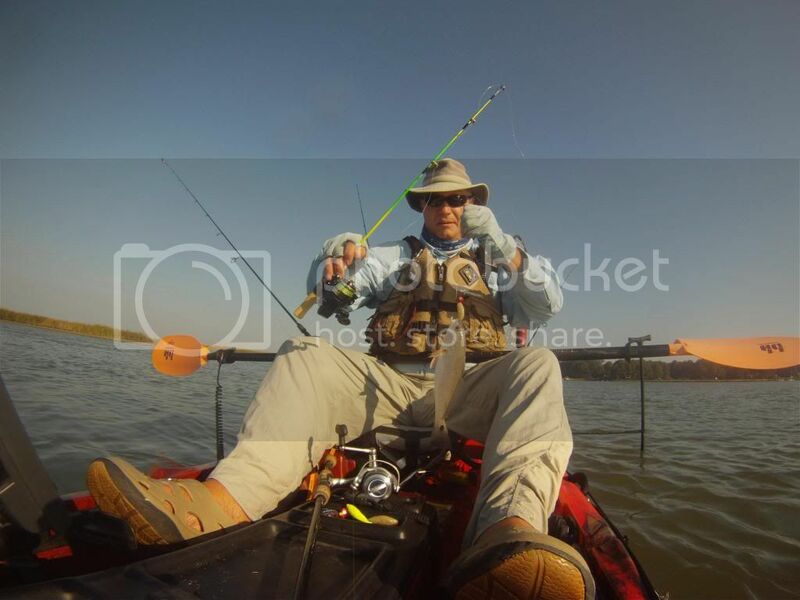 I did replace the line with 15 lb braid and used a 20 lb fluorocarbon leader. I then put the mini-rod away and started using my normal set-up. I managed to catch another small Red in the same area. I don’t know but something got into me to just play and use the mini-rod set-up for the day. I was having a great time with the smaller rod. I managed to bring in another Red, a Croaker, and a Pin Fish. In the mean time ElGeeBee managed to catch a Pin Fish to fill in the zero from Friday. Marian managed to arrive with Alice & Dave but they decided to go fish Broad Bay instead. Later that day prior to heading to the banquet at Salty C’s; Marian told ElGeeBee and me that she managed to catch a 15 inch Red. Her story is that she thought that she had a snag. So her sister paddled over to try to get it loose. The line was no longer snagged but eventually got hung up again. This time Dave paddled over to the end of the line and got it free. He decided to just lift the line from the water and they discovered she had this fish on the end of the line. At the time the story was pretty funny. 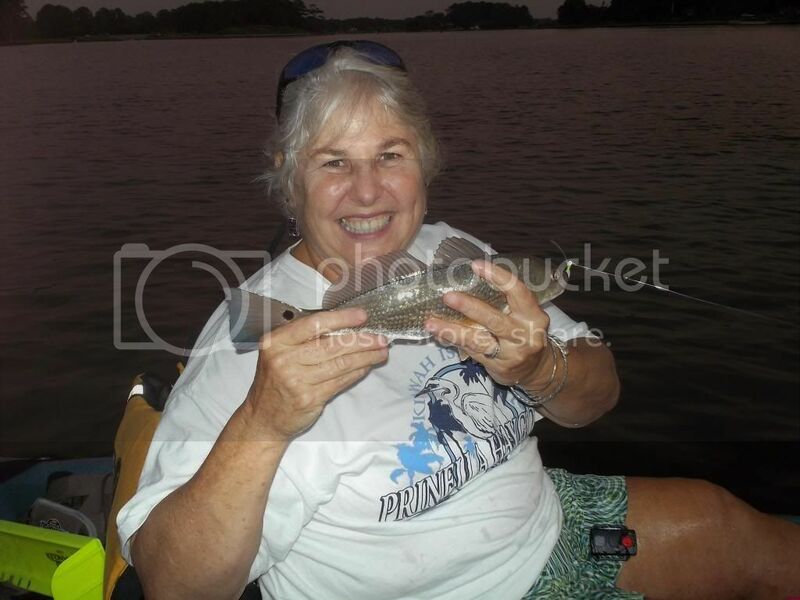 At the end of the day, Marian had the biggest fish at 15 inches. The banquet at Salty C’s was super. Dinner was BBQ Pork, Cole Slaw, Chips, & Baked Beans. 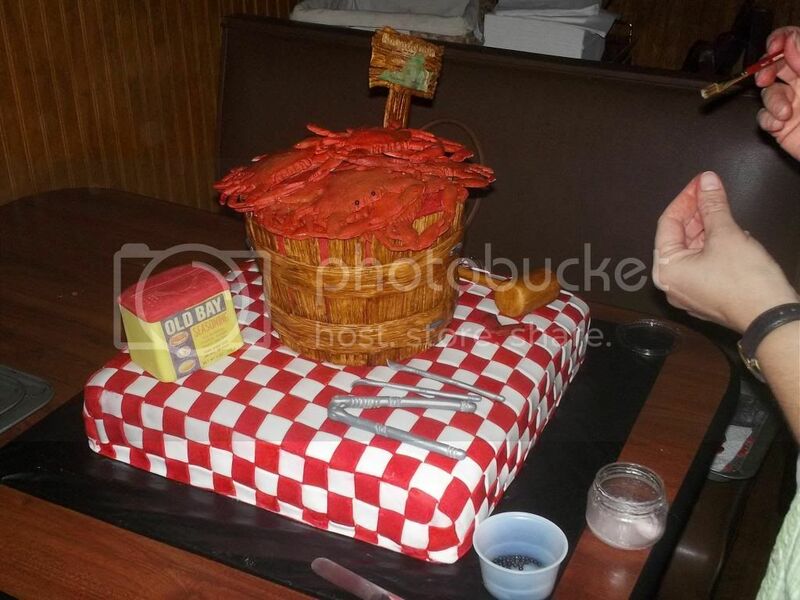 Desert was a cake in the shape of a bucket of crabs. The raffle prizes were outstanding. The Boondogglers managed to raise about $1,000 for Heroes on the Water (HOW). The next event for the Boondoggle was the Rob Choi’s Fish Print class (The art of Gyotaku fish printing). Marian & I volunteered to host this event in our cabin as Marian has been doing this for a few years. She learned this art form from her Dad. The little cabin was full of interested folks. Thanks to Robert Lee (not the General) for providing a nice Flounder for the printing. Several folks after the demo made prints of the Flounder including Chad Hoover. The next morning ElGeeBee and I got up early to fish Rainey Gut for Trout. 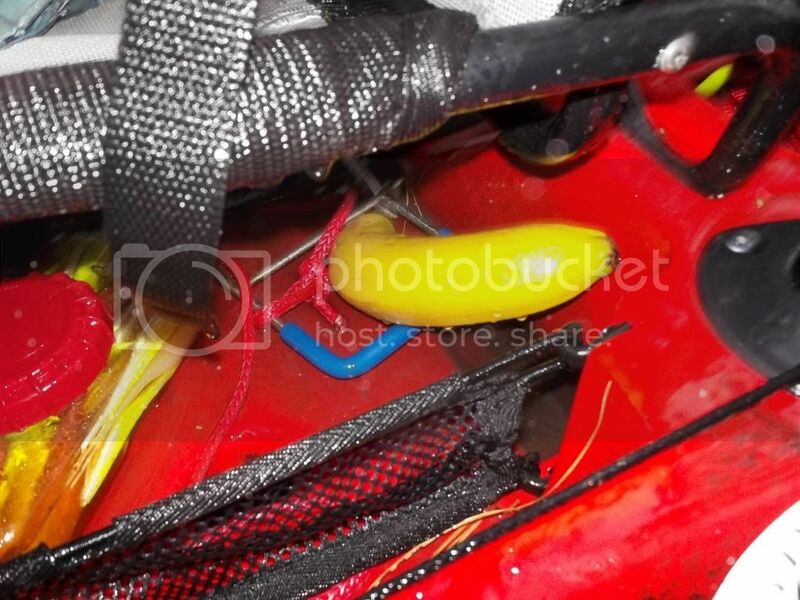 While loading up our gear we noticed that someone had inserted bananas into our rod holders. Someone was attempting to jinx our fishing for Sunday morning. We quickly disposed of the bananas on someone else’s kayak. We launched at the beach on Broad Bay and headed to the left to the Rainey Gut. Heading into the opening of the Rainey Gut we noticed a helicopter on a dock. I made me first cast and had a fish on; a nice Redfish was landed for a photo with me. This got ElGeeBee really excited since he was still hoping for something other than a Pin Fish. 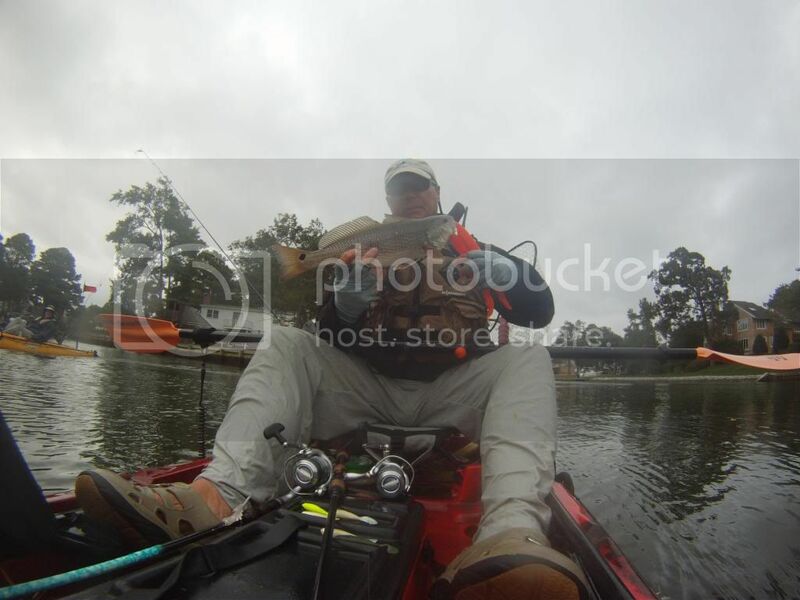 Eventually ElGeeBee got a nice Red and the bad luck was gone from his Kayak. We fished this section all the way up to Crystal Lake. Then it started raining so we started to head back to the beach launch area in Broad Bay. That day we felt we were successful. ElGeeBee managed to land two Reds, a small Speckled Trout, A Back Sea Bass, and a Flounder. 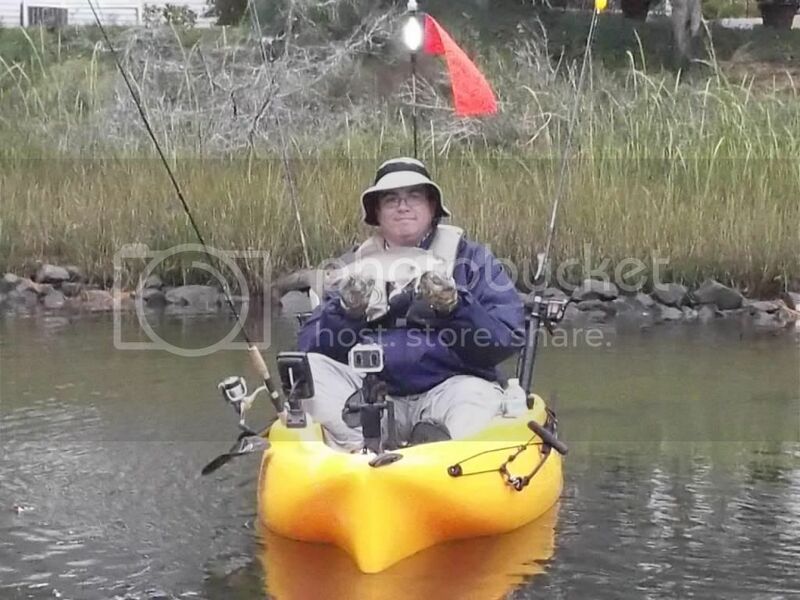 He managed to get an Inshore Slam at the Boondoggle. As for me I was not that fortunate; I managed to land four Reds (Longest being just short of 17”) and a single small Trout. Back at the beach we meet DeckApe who was out searching for some Boondogglers as he could not join us on Saturday. We visited in the rain telling fishing stories. As we started to remove equipment from and off of our fishing machines I noticed a banana under my Jackson Cuda seat. The only think that I could think about that I managed to prove that the myth of bananas on a boat or ship did not jinx my fishing. Or maybe it did after all I did not get my Inshore Slam. What a way to top off the Virginia Beach Boondoggle. But wait we still have the group potluck. The hidden Banana did it prevent me from an Inshore Slam? The group potluck is nothing more than the remaining Boondogglers get the opportunity to tell their fishing tails, say our good-byes, and discuss the next upcoming Boondoggle. Hopefully as you read this lengthy report about my experience at the Boondoggle it will spark some fire in you to join us at Kar Park on Merritt Island, Florida for the Presidents Day Boondoggle in February.